India is the largest democratic country in the universe and while we take great honor in saying that; we must know that to make it democratic, our constitution has the major role. This day is also declared as the national festival and every Indian must take pride in enjoying and celebrating this day with their heads held high for being a member of such a great country. A country that is so rich and well endowed with cultural heritage, people from different religions and regions living together. India is a country that is the best and the live example of Unity and Diversity. It is rather quite obvious and normal to be startled with the heading. Of course the constitution came into force on 26th of January in 1950 but it was 2 decades earlier that this day was decided to be given an important place in the history. Earlier since 1930 this day was celebrated as the Independence Day or the Poorna Swaraj Day as this was the day when India decided that it was going to fight for achieving complete freedom. The day when something this important was decided could not go unnoticed so this Republic Day was made to coincide with the day of Swaraj as the leaders didn’t wanted it to go unnoticed. We all have heard that we are living in the Biggest Democratic country of the world and that is no coincidence. In fact to make India the biggest democratic country; a well informative and descriptive constitution was also necessary and so we got that. India has the longest written constitution in the world having 448 Articles that are written in 22 parts. It also has 12 schedules and 97 Amendments. Now as we have already read in the previous heading that India has the longest written constitution and it is obvious that something so big and descriptive was not an easy thing to be written. It took 2 years 11 months and 18 days to draft this constitution and that too by our very honorable Dr. B.R. Ambedkar. Initially when the constitution was firstly introduced; its 2 hand written copies were made. These 2 copies were made in the languages English and Hindi. 308 members of Assembly signed both of these copies on 24th of January in 1950 and it was 2 days later that the constitution came in force in the country. Both these copies are presently kept in the Helium filled cases and are kept safe in the Library of Parliament House. And both of these copies have witnessed 94 amendments since their inception. “Satyamev Jayate” which is the motto of India has been taken from the Mundakan Upanishad from Atharvaveda. The translation of this was carried on by Abid Ali in 1911. Not only this; but behind the selection of this motto was the great leader Madan Mohan Malviya and thus we got one more reason to thank him for. We are familiar with the fact that Rabindranath Tagore wrote the national Anthem but in the very first place, Tagore wrote the anthem in Bengali which was later on translated by Abid Ali in 1911, in the same year by the same person responsible for Hindi translation of our motto. And it was in year 1950 that this was adopted as the national anthem of India. 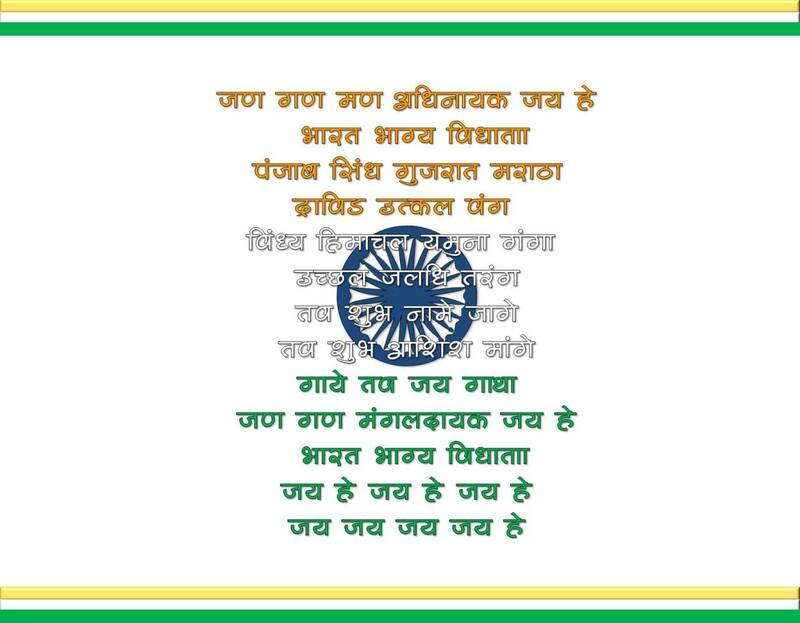 It is also to be known that it takes 52 seconds to complete the national anthem of India. We Indians are proud of our National Emblem and there are many reasons for feeling like this. But as far as the origin of this is considered, we have to know that our emblem is adapted from the Ashoka Pillar at Sarnath which itself dates back to 250 BC. And our beloved Tiranga which we love and respect so much was actually conceptualized and designed by a farmer named Pingali Venkaiya. But the original and the present design was given by Mrs. Suraiya Badr Ud Din Tyabi who was a reputed artist back then. Since Tiranga is our national flag it is very much understood that rules had to be made to ensure the right treatment towards this flag. Ratio of our flag’s width to length has to be 2 to 3. There are only some of the specified sizes in which the flag can be made and earlier it was also necessary that it has to be made in Khadi only. Even now the flags that are used on government buildings are made of Khadi, not only this; but the thread that is used in it must also be of Khadi. Also it was also made clear that Tiranga must not ever touch ground or water and could not be used as drapery. Our leaders made it sure that while they are writing such a detailed constitution; there must not be any mistake in its completion. So they took the best aspects of the constitution of other countries. For instance the liberty, equality and Fraternity of our country’s constitution are inspired from French Constitution while the Five year plans are taken from the USSR constitution. This constitution of ours actually replaced the British Government’s Government of India Act 1935 and this is the reason that this day is honored. While Republic day is considered to be a celebration of single day by many. We have to know that Republic Day celebrations continues to 29th January when the Beating the Retreat actually marks the end of Republic Day Ceremonies. Also the Christian song, Abide with me is always played at the parade of Republic Day which was the favorite song of Mahatma Gandhi; the Father of our Nation. The prestigious awards like Bharat Ratna, Padma Bhushan and Kirti Chakra are awarded by the President on the Republic Day. So these were some of the interesting facts that each and every Indian must know or at least know about our country’s Republic Day and the constitution that was enforced on the very same day. And while we are informing you about these facts, we would also like to take a moment and wish you a Happy Republic Day!